Your local comedians work hard to bring the jokes and puns every night but they also have to pay the bills. Making money exclusively through comedy is not a plausible option for most so we’ve been hanging out with the local talent to find out what their day to day lives look like. We caught up with comedian Zach Smith at his home in OKC. Zach is no rookie to the comedy scene; he recently beat out 27 other comics in a competition for a spot in “The Out of Bounds” comedy special in Austin. When Zach isn’t onstage he’s driving about 3000 miles a week making deliveries. And when he’s not driving a delivery truck, or telling one liners you can find him at his home hanging out with neighbors, family, and friends. One of his common evening past times is playing dominoes. 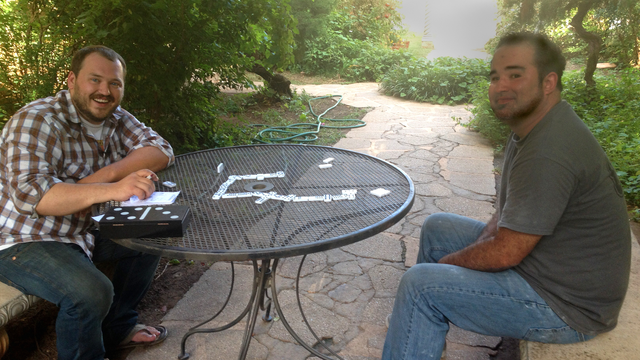 We shot video of Zach and his neighbor playing a couple rounds of dominoes after a hard day’s work. Zach is just one of the comedians we’re focusing on in this segment. We also spent some time with Madison Allen who spends his days as a server at Hideaway, and Josh Lathe who works an office job. We will soon be gathering video of family man and comedian Brian Stephens as well as Jenny Godwin, a stay at home mom by day and punny comedian by night. The content of this segment continues to grow as we laugh at comedy sets and get a glimpse into the everyday lives of these comedians. Catch this segment premiering in October to see what it’s really like to be a comedian today.